Learn how to report the Qualified Small Employer Health Reimbursement Arrangements (QSEHRA). The 21st Century Cures Act allows certain small employers to reimburse employees for healthcare coverage purchased through the individual market. The law includes stipulations for Qualified Small Employer Health Reimbursement Arrangements (QSEHRA). We'll tell you all you need to know about it for the W-2 and online payroll. The plan is solely funded by the employer, without any employee wage contribution. Employee provides proof of coverage. All eligible employees must be allowed to participate. Funds can be used for payment or reimbursement of eligible employees. Or eligible employee’s family member medical expenses, including health insurance premiums. Payments/reimbursements are limited to $5,050 for an individual. And $10,250 for family (limits will be indexed annually). Reimbursements become taxable for any month the employee does not have coverage. Employer is not considered an Applicable Large Employer (ALE). Meaning less than 50 full-time employees or equivalents. 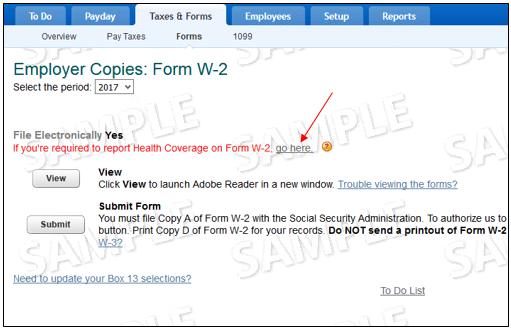 In your To Do tab, under It's time to file forms, select W2, Copies A & D.
You will be asked if you have paid retirement plan outside Intuit Online Payroll. Select Yes or No. Enter $ amount per employee under Total for Box 12FF. Select View to review the form. 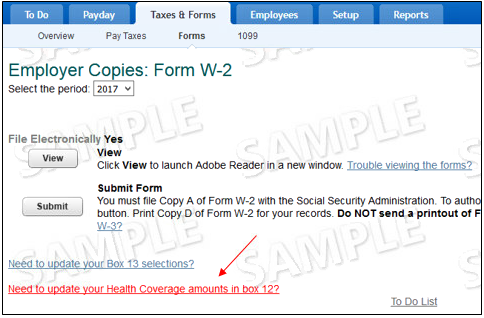 To edit amount, select Need to update your Health Coverage amounts in box 12? Whenever you're ready, select Submit. In your Dashboard, under Task, select Show more beside payroll tax forms outstanding. 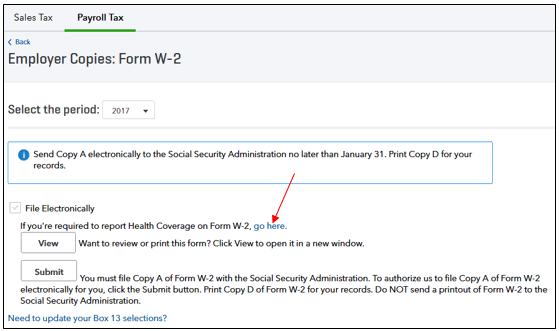 Locate W2, Copies A & D (2017) filing. Then select File now. Select Annual Forms. Then select W2, Copies A & D.
You will be asked if you have paid retirement plan outside QuickBooks Online Payroll. Select Yes or No. Enter $ amount per employee under Total for Box 12 FF. Contact Payroll Support for assistance. You have two options to settle reimbursements. You can settle with the employee directly or track the reimbursement through payroll. Rename reimbursement name to QSHERA. 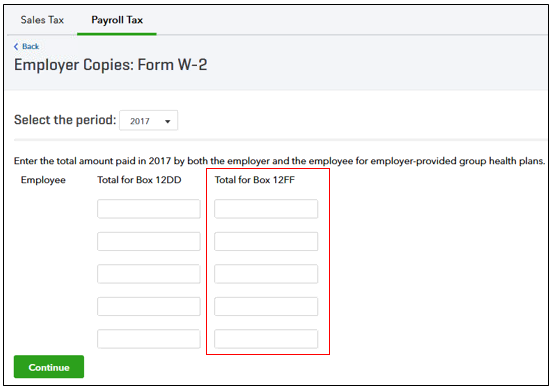 Amount can be added when running payroll. 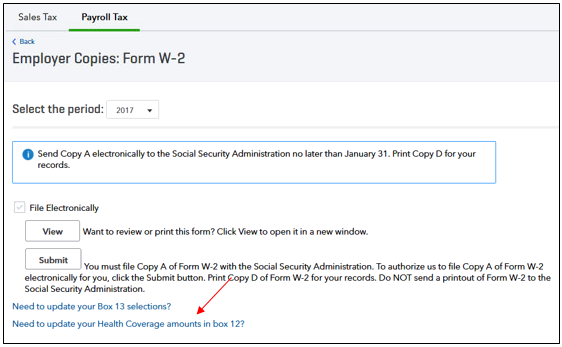 Note: Adding this pay type doesn't automatically generate an amount in box 12 with code FF unless you follow the W-2 reporting steps. You can run a report to see the total QSHERS for the year for each employee. Under Employee Reports, select Payroll Details. Change the Date Range to last year. Change the All Checks drop-down to Summary by Employee. Then select Update Report. The total QSHERA for the year per employee will show. Change Date Range to last year. If the QSHERA amounts are incorrect, contact Payroll Support for assistance.